Apple’s stock apps for the iPhone, iPad, and iPod touch are great—for the most part. But what if one of those preloaded apps doesn’t quite fit your needs? With thousands upon thousands of third-party apps to choose from in the App Store, finding replacements for Apple’s offerings can be an overwhelming task. That’s why the editors at Macworld have done the work for you, scouring the App Store for twenty stellar apps that do all Apple’s stock programs can do and more. 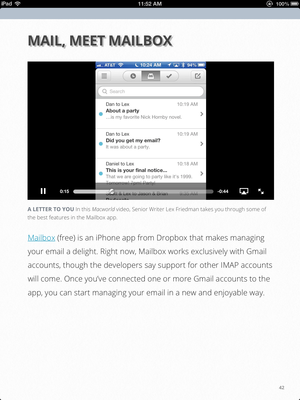 Our Upgrade Your Apps buying guide is available as an iPad-exclusive book for the iBookstore. It provides thorough primers on each app along with extra information like video tutorials, screenshots, and pros and cons when compared to Apple’s stock applications. So if you’re ready to ditch Apple Maps, make your last scribble in Notes, or say sayonara to Siri, use these excellent apps to help you make the most of your iPhone or iPad. Want a peek inside? You can download a free preview of the book from the iBookstore. And to get Upgrade Your Apps on your iPad, you can purchase it from the iBookstore for $2.99. Our iBooks Author books are built exclusively for the iPad and iPad mini, and include video, audio, slideshows, and other multimedia content not found in our regular books. Think of it as a cross between our print magazine and our website—great content with audiovisual bonuses. 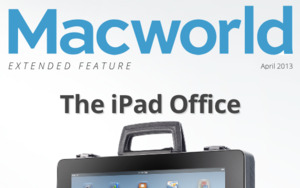 Macworld extended features are packed with great how-tos, video, and opinion content. Previous books include The iPad Office and 12 Things Every iPhone and iPad User Should Know. Check out one today and let us know what you think!